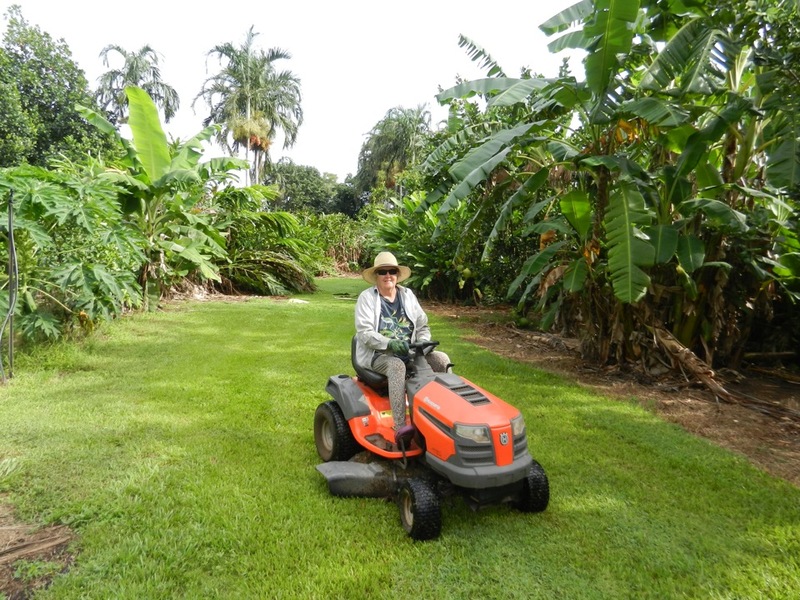 One of my major occupations now that the rains have started in the Top End, is mowing. We have about four hectares in the flower plantation and gardens, and weeds are our major bugbear. To minimise these, what isn’t flower bed is lawn, well sort of; mowed grass would be more accurate. When I was sitting on the ‘ride-on mower’ yesterday, for which I seriously thank its inventor, I was musing as to what a soothing occupation mowing is, particularly largish areas. One sits, not really thinking, only conscious enough that you don’t run into anything, or over anything you might want to keep, and meditating on the world, the weather, the business, or the sheer joy of going around and around in complex patterns. I find it is rather like meditating, but for a fidget like me, meditation combined with action – most satisfying. On the practical side – mowing is the first bastion against weeds – you should always mow frequently enough to prevent seed from forming – these are the seeds that sprout in your garden beds, and it is much more difficult to remove them from there, than to decapitate the flowers before they spread seed. I have also noticed that the more years you mow your rough grass, the more like lawn it becomes – constant cutting removes the clumps of rat tail, mission grass, Sida, Ipomea, and even Onion grass. Eventually the lower growing creeping grasses take over and choke the other nasties, and since they are lower growing, you don’t have to mow so often. Looking after these grasses is important therefore, and one critical factor is, not to have the mower blades set too low – 8 or 10 cm. is about as low as you should go, so as to prevent the base of the little grass plants from being exposed to the sun – if they get too hot, they are set back badly, and bare spots not only look nasty, but leave spaces for undesirables to grow. My final word on mowing – if you don’t have to, don’t catch the grass clippings and take them away. Leave them to sink back into the lawn – this provides fertiliser, protects the cut grass for a few days, and improves the soil underneath by providing organic matter for all the little good guys who live underground. This is also known as carbon storage, and you are doing your bit against global warming. Oh, and don’t forget to look after your best friend, the mower – keep it clean, and have it serviced regularly.